A practical packaging of the Uni-Vibe sound for ease of use. Build quality. Easy to use. Captures some, if not all, of the Uni-Vibe's tones. GuitarSystems is a Netherlands-based firm that aims to build guitar tools for pro players, focusing on sound quality, reliability and ease of use. 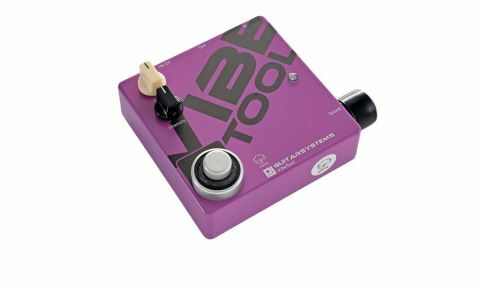 All of it's pedals are based on vintage designs and here the VibeTool recalls the legendary Shin Ei Uni-Vibe. The singular character of the original and its use by Jimi Hendrix makes it a pedal that effects manufacturers strive to emulate, with mixed results. "The GuitarSystems approach seems to focus on the Uni-Vibe sound, rather than copying the original controls"
The GuitarSystems approach seems to focus on the sound, rather than copying the original controls, so there's no switching between 'chorus' and 'vibrato' modes, and the volume knob is replaced by switching that's adjusted for unity gain. What remains is an intensity knob and a large rubberised speed knob at the side of the pedal that you can adjust with your foot. There's also the TMF (Treble Middle Full) knob, which is very useful for rolling off some low-end for less of a pronounced throb when using humbuckers. It may not do the full range of Uni-Vibe sounds, but what the VibeTool does will be instantly familiar, with a lovely warm tone. You'll have to have deep pockets to buy the VibeTool - but if you're a sucker for those classic Hendrix and Trower sounds, it will provide them.